I was motivated by today’s Gospel reading to enter into the Ignatian Spiritual Exercise of imagination. In doing so, I tried to apply my senses (such as sight, hearing, smelling and touch) to visualize myself in the shoes (or sandals) of those journeying from one town and village to another accompanying Jesus. I was drawn to reflecting on what my life had been like prior to joining up on this journey. I knew that Jesus had to have become the center of my life. How did that happen? How did I act when Jesus was only a part of my life? Sadly, when Jesus is only a part of our lives, not the center, oftentimes we spend a lot of time trying to achieve what we think we are thirsting for such as worldly goods and riches. Many of us live our lives bombarded with these false forms of happiness. Oftentimes, we don’t realize that these false thirsts distract us from the deepest thirst of our human hearts - God. longs for all of us to become disciples. He knows that true happiness doesn’t come through going through the motions of “acting” like good Christians by following rules. True happiness comes through entering into a deeper relationship with Jesus. In order to develop this relationship with Jesus, we need to spend time with him. There are many ways to spend time with Jesus. To name a few would be through prayer or reading the Scriptures. When we spend time with Jesus, Jesus starts to matter. Jesus starts to become more of the center of our lives rather than just a part. When Jesus is the center, that is when we want to imitate him and his life. That is when we want to be his disciple and accompany him. Discipleship motivates us to live life beyond the here and now. We are motivated to pursue righteousness, devotion, faith, love, patience, and gentleness. We also need to remember that (just as those accompanying Jesus in today’s Gospel) we are all still subject to sin. Discipleship doesn’t mean guaranteed perfection. What becomes important, is how we respond to our sin. The exercise for the past couple of days brought me to pull out my pictures from the pilgrimage to the Holy Land I was on a few years ago. 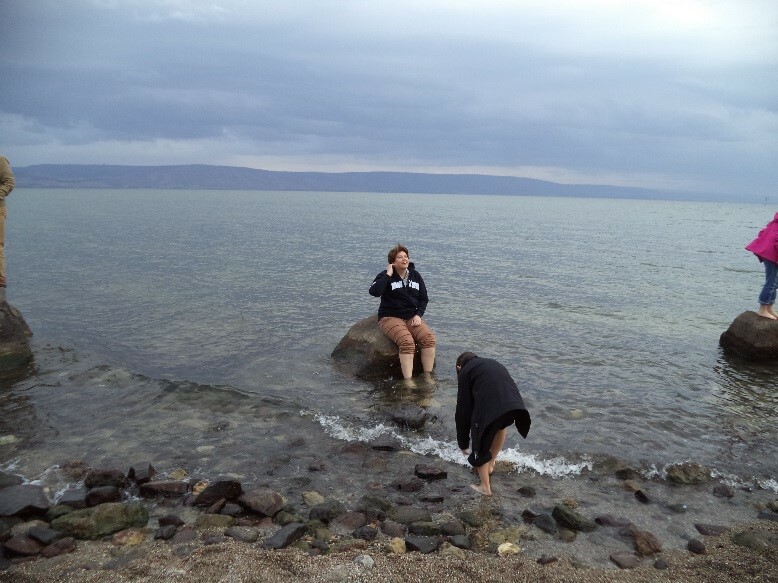 This is a picture of me at Tabgha, on the north-western shore of the Sea of Galilee in Israel. After a long day accompanying Jesus, we spent some time relaxing in the water.